Membership Info Would you like to be part of an interesting group of people who are engaged in one of the most exciting sports anywhere? You don’t have to be a jumper, or parent of a jumper ... come and see what we’re all about! We think you will enjoy SPSC! There’s a button at right to bring up a copy of our membership form. 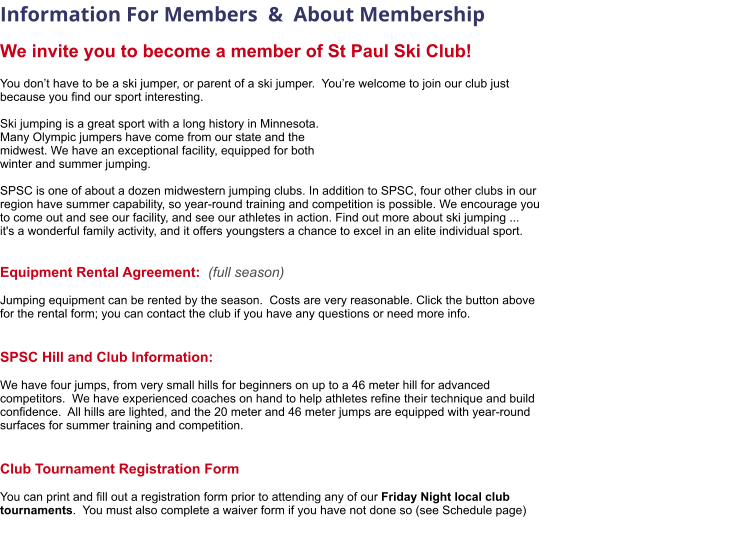 We invite you to become a member of SPSC! You don’t have to be a ski jumper, or parent of a ski jumper. You’re welcome to join our club just because you find our sport interesting. Ski jumping is a great sport with a long history in Minnesota. Many Olympic jumpers have come from our state and the midwest. We have an exceptional facility, equipped for both winter and summer jumping. SPSC is one of about a dozen midwestern jumping clubs. In addition to SPSC, four other clubs in our region have summer capability, so year-round training and competition is possible. We encourage you to come out and see our facility, and see our athletes in action. Find out more about ski jumping ... it's a wonderful family activity, and it offers youngsters a chance to excel in an elite individual sport. SPSC Hill and Club Information: Administrative stuff: Club Tournament Registration Form You can print and fill out a registration form prior to attending any of our Friday Night local club tournaments. You must also complete a waiver form if you have not done so (see above) Equipment Rental Form (full season) Jumping equipment can be rented by the season. Costs are very reasonable, Click the button above for the rental form; you can contact the club if you have any questions or need more info.